The original ST97 had the Trishock system, the we had a few some with an Incabloc system. The ST 974 with date at three came with Kif System using spring 5-3. 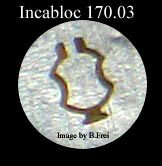 One lower Incabloc spring for FM/ST 97, 974 & Valjoux 7750. Lower Incabloc spring for FM/ST & Valjoux 7750 movements that have incabloc shock springs a package of 5 might be a good idea. The lower side is dial side of the movement. Use the upper sping and cut to size. ORDER THE UPPER ONES AND CUT THEM DOWN TO FIT THE LOWER SETTING!!! BETTER YET FOLLOW THE WARNING ON THE TOOL KIT PAGE AND DO NOT MESS WITH THE LOWER SPRING. This cap jewel works for both the upper and lower part. Uses the same clickspring for the upper and lower part. Uses the same clickspring for the upper and lower part. It comes in packages of 5. The upper side is the balance side. One complete upper setting INCA-444.12.412 (complete with hole jewel, cap jewel & spring).